We’ve written recently about how to speed up jenkins builds so that you can accelerate your CICD pipeline when running Jenkins Docker workloads. In this post, we will deploy a fault-tolerant Jenkins service using Docker Swarm backed by Portworx volumes. You can view a demo video here: https://youtu.be/tH0Et7iEQ04. First, let’s get an overview of our setup. A shared, replicated Portworx volume will be used by the Jenkins instances for the jenkins home directory. Let’s dive right into it and see how we set up our HA Jenkins Docker environment ! On worker-1, worker-2 and worker-3, use the join command given in output of swarm init command. 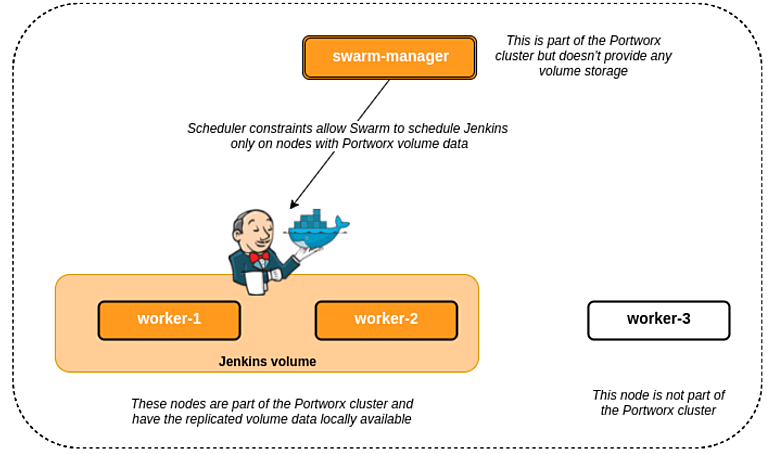 Install Portworx on the swarm-manager, worker-1 and worker-2. Detailed installation steps can be found here. In this demo, we don’t give any devices to the Portworx node running on Swarm manager. The volume should have it’s data replicated to 2 nodes which can be seen in below output. We also specify a scheduler constraint which instructs Swarm to schedule Jenkins container only on nodes which have a label for our volume. This will result on Jenkins having local access to volume data leading to great performance. Observe the node on which Jenkins is running & perform initial Jenkins setup by going to http://<node-ip>:8082/jenkins. 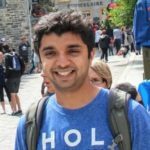 Create a test project and run some builds! Find the worker which is running the Jenkins container and drain it. Observe that Jenkins will now run on the other worker which has the Portworx volume. This is because of the –constraint we specified while creating the service. Without the constraint, Jenkins could have been scheduled on any other node in the Swarm cluster. Access Jenkins on the new worker node and observe that all our data is still intact! In a production scenario, the Swarm worker nodes can be fronted by a load balancer or a service discovery which directs the Jenkins requests to the node running the container.